Stop confusing accept and except in sentences. Use the right word the right way at the right time by knowing these 65 misused English words pairs! Write English more accurately and proficiently by understanding the difference between these commonly confused words with definitions and example sentences to help you. Published by H.E. Colby, 2014. First edition. March 30, 2014. Copyright © 2014 H.E. Colby. Noel, Alex, Melissa, Heather, and Winfield with all my love. Accept" or "except"? "Complement" or "compliment"? "Principal" or "principle"? It is easy to misuse any of these words while writing letters, memos, or reports for the boss. These words are similar in sound, spelling, or meaning. Stop being confused starting today! As an experienced English professor and author of Business English Ace, I know students of Business English are often confounded by the tough, but essential small points of the language. That is why I wrote Top 65 Commonly Confused English Word Pairs. You will find 100 sets of commonly confused words with definitions, example sentences, and practice exercises that should help you not only understand these words, but use them correctly. 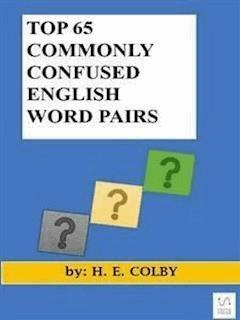 Use Top 65 Commonly Confused English Word Pairs to improve your English starting today. Take the book to the office or class. When you have a doubt, look up the word and get the right word right the first time! Professor Colby is an experienced English instructor who has been helping students meet their language and professional goals since 2007. Please visit her blog and sign up for the Business English Update newsletter for more tips. Add me to your Google+ Circles.